I hope you are all having a great Friday, what can be bad about a Friday after all, it is basically the start of the weekEND! Yay! I don't have any particular plans for the weekend, partly because my husband is traveling at the moment, I might choose to get the most of the house on my own, anyone relates to that? Right, we all need another natural eye shadow palette like a whole in the head but we can't help it can we? So I asked my dear friend Linda, who kindly picked one for me from Singapore. Thanks Linda! Left most: A light neutral gold with satin to shimmery finish. This shade is a little too dark to use on the inner corner for me but applied all over the lid it is stunning. Left: A mid-toned bronze with satin to shimmery finish. 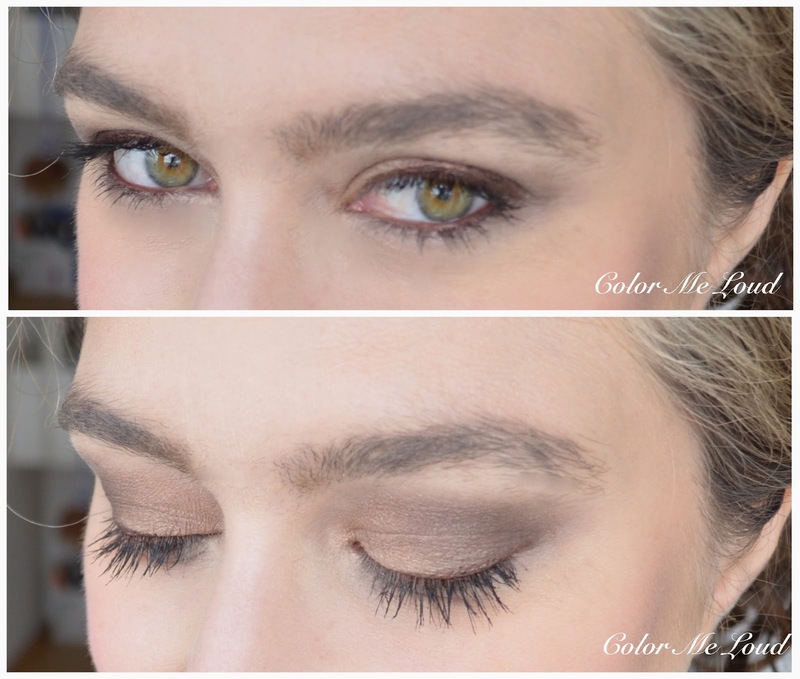 This is a great color for lazy days if you are in the mood for a one color eye make-up. Just swipe and go. Right: A mid-toned taupe with shimmery finish. This shade is fantastic, it is one of the most gorgeous taupes I own, simply because it is not too cool nor too warm. It is not too shimmery nor too flat. My favorite of the four. Right most: A very deep blackened brown with subtle sparse shimmer. It is dark enough for drama if you want some but it also blend beautifully, great shade for definition. 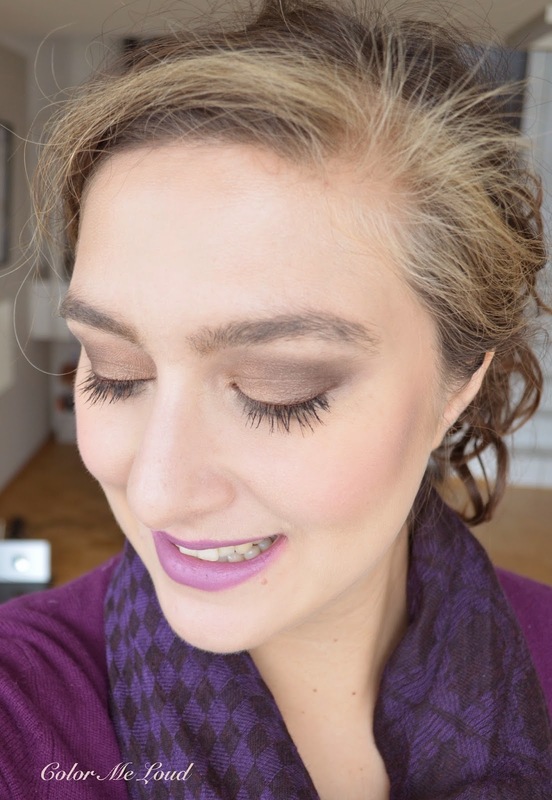 Below I am wearing the taupe all over the lid with a touch of deepest shade on the outer corner. Here comes my only complaint about the formula, it doesn't layer so well. So if you already applied one color, you may not build up another on top. That mean if you want a defined smoky look, you have to start with the darkest shade. Below as you see, although I tried and although the darkest shade is dark enough, it doesn't show all that well. Below you can see the look in context. I love how complex the taupe shade is without being too shimmery or metallic, thumbs up for this. On the other hand it looks like I am wearing just one of the shades since I couldn't build up the darkest over this one, there I am giving a pinky down. You live and you learn, of the second look, I started with the lightest shade (gold) and applied it at the inner third. I then applied the bronze shade over the rest of the lid and tried to leave the crease free as much as I can. I then applied the deepest shade (deep brown) on the crease. This is a warm look after the cooler one above. 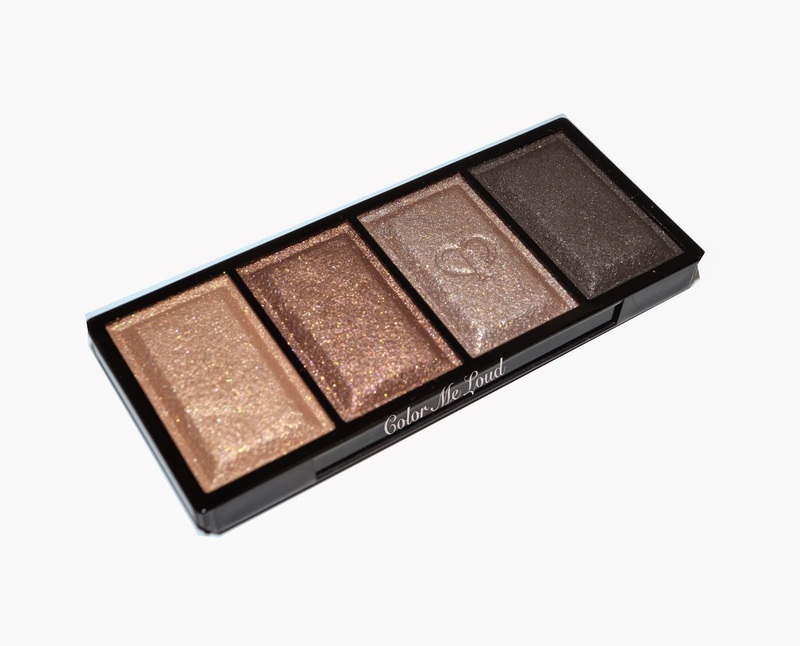 What I like about this palette is that you go warm or cool as you wish, it is very versatile. 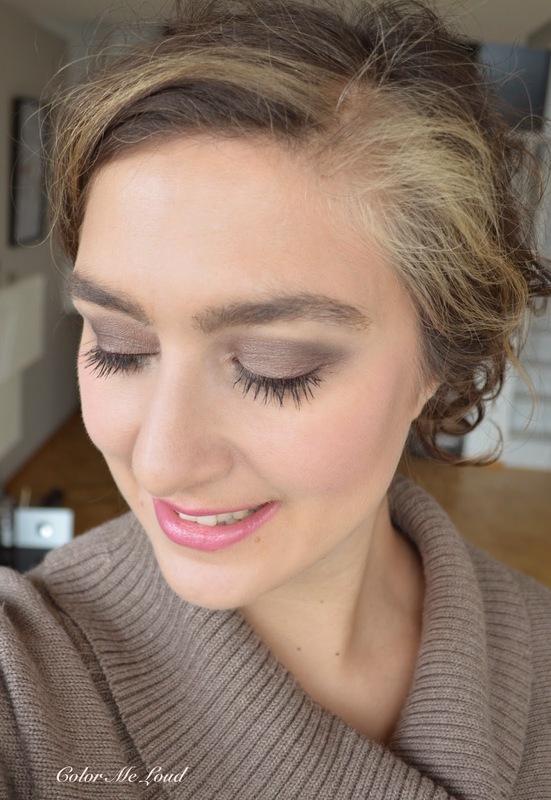 You have seen the look in context in the last post when I was talking about Nars Audacious Lipstick in Dominique. Here is how my eye lids looked like (which you haven't seen yet). Again building up of this formula is not that easy but the versatility of the palette and easiness of application is amazing. 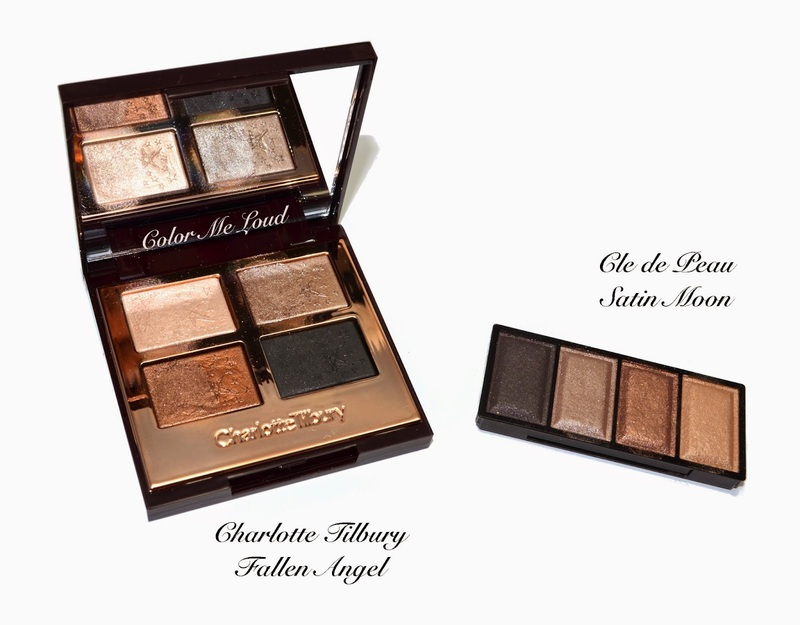 I have noticed that Satin Moon resembles a recently released palette from Charlotte Tilbury's Holiday Collection, called Fallen Angel (reviewed here). They are indeed quiet close, but on the eyes Fallen Angel is much more metallic, with more sheen whereas Satin Moon is more subtle. I find the sheen in Satin Moon much better than Fallen Angel but in terms of buildability and layering Fallen Angel wins since Satin Moon fells short in that aspect. In terms of shade the most different one is the lightest shade which is deeper and warmer in Satin Moon. One more thing to note as last is that Satin Moon has some perfume to it. It is noticeable if you sniff the pan. Many probably won't but it is my job to do everything strange with make-up here. I just wanted to let you know if you are extra sensitive to smell or perfume. Also check out wonderful reviews of Sabrina, Linda and Jenny. Final thoughts: Satin moon has one of the loveliest shade combination I have in a neutral palette. It is very versatile too. You can create cool as well as warm eye look with this one. The shimmer in Satin moon is complex and not too over the top, which again makes it perfect as an everyday neutral palette. My only complaint is that it doesn't later all that well, so if you have already applied a certain shade, you may not apply another at the same spot. This aspects makes life harder if you like some drama, some smoked out corner or lash line. All in all to me Satin Moon is a great palette, but not perfect..
Do you apply the darkest shade first on your eye make-up or you start with the lightest one. Let me know how you go about it. I love mine, and have used it so very much. Love the Taupe and the Bronze. Didn't really know what yo fo with the Gold,, so will try what you did here. I am glad to make you use the gold one, it is really gorgeous and combines well with the rest of the shades. Hey Sara, this one was totally on my wish list and while it might still be, I'm beginning to have doubts about it. I didn't know the shades don't layer that well! I'm not so sure I want that in a palette. I do still like the looks you came up with though! it is like if you apply one shade at a certain place, the other doesn't show up that well if that makes sense. It may be because they are very opaque and pigmented, because to layer one needs some transparency. I like the formula, just don't love it. I know what you mean about being special. Some would like to spend of basic shades though, but our stash is a little too crowded for that. P.S. "it is my job to do everything strange with make-up here" - LOL! Same here! But in my case I poke holes, I crush, I scratch, I destroy (my makeup). But you probably already know that haha. LOL Jaa, I know what you are doing to your make-up! I am sure make-up products are running away from you once they see you "don't hurt us please!" But therefore you make the most gorgeous photos of them! Yes they have that tiny sheen/sparkle, which is not over the top but very multi-dimensional. Love that too! CT one is more metallic but that one is also very complex. Lol! I hadn't realised these had a scent! Going to smell mine now! I don't really blend my looks much, so I've liked how good these look upon application with little blending, but then again, I havent tried Satin Moon in particular. I used to start with the lightest shade all over the lids, but recently have been doing horizontally upwards looks, so I start with the darkest shade at the lashes. This is such a gorgeous quad- versatile, indeed! I have the Baby Universe quad from this range and really love it, but I think you've nailed it on the layering issue- that's the only downfall I've found as well. Love Satin Moon! The formula is simply dreamy - pigmented, yet still soft and airy. It's more of a sophisticated, elegant palette, rather than a glitzy, glam one. The shimmer is so well done - I wish that there were more palettes like this. The taupe is my favorite too. I prefer the first look - stunning- (I usually start with the taupe too, or layer all the shades) - but the second look is beautiful too. yes it is so pigmented and complex. You are right about sophistication too, I believe they have 6 more palettes? Have you checked them out? I like the taupe too, my favorite! 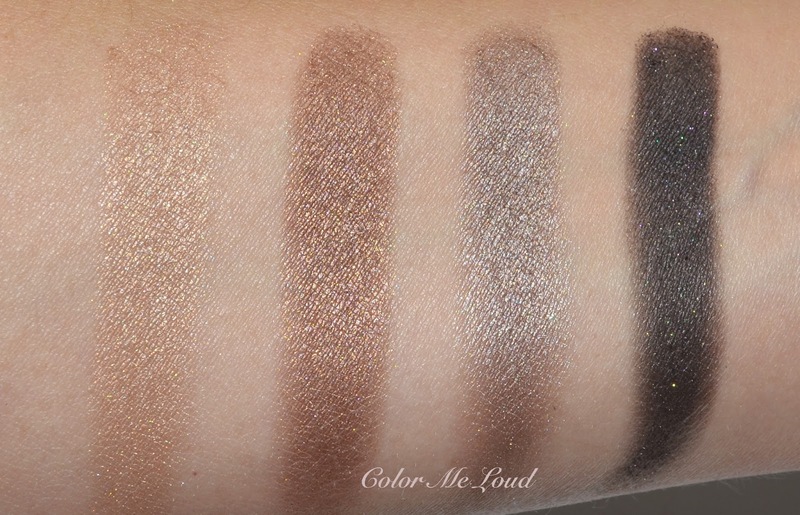 Gorgeous colors and nice shimmer, but the difficult layering and perfume kills it for me. Katherine T.
If you are very sensitive to perfume, you might notice it, it is rather subtle. That's odd about the layering issue. I have the 307 and haven't had trouble with it. I'll wear it tomorrow to double check. These definitely look more shimmery in the pan than on the eyelids. Yes, please let me know... This is right in the pan it is more shimmery but on the eyes it is complex but there is not too much shimmer, which I actually like. LOLOL now I have this image in my head of you testing the make up in all kinds of strange ways: does it bounce? how much water can it absorb? what does it happen if you put it in the oven? Hi Sara, you are always more than welcome to shop my market! ;) Let's wait for Spring shall we? Meanwhile, yes you're absolutely right about how the shades dont show up well when blended. I thought it was me overblending like a crazy woman, or the lack of color intensity range across the palette. Whichever the case is, i'm sure glad to see you managed to get it to work. I only managed to get it to work with just 2 shades... if I used more, it just becomes rather muddy and not very defined. Which seems to be the way these Asian palettes are designed anyway due to our lack of a defined contour. You should seriously consider the holiday coffret... i think you'll find that palette works much better!